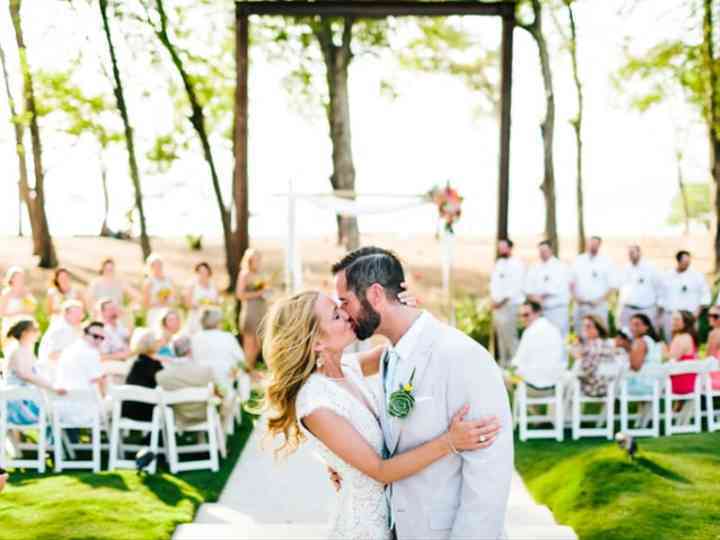 If your dream wedding involves saying your vows away from home with the sand between your toes, in a vineyard or on a mountaintop alongside your nearest and dearest friends and family, you’re going to need to know how to plan a destination wedding. Whether you want to get married in the Caribbean, Europe or another part of Canada, we've got all the tips and tricks you need to know. Here are essential tips on how to plan a destination wedding. You’ll need to get the whole wedding planned while also making sure you’re ready for your trip (don’t forget to get those passports renewed!). And, if you expect your friends and family to up and leave at the drop of a hat, you’re not thinking realistically. Destination weddings not only take time to plan for the couple, but also the guests. They’ve probably got to negotiate time off work and move around some money, so you’ll want to send out those save the date cards ASAP and destination wedding invitations at least 3 months before. Thought choosing a venue was difficult? Wait until you have to choose a destination wedding location. In this case, the world is quite literally your oyster. While beachy weddings remain the most popular, there’s a bevy of options beyond the sand and seas. Want to get hitched in a village in Italy? Do it! Prefer a vineyard in Canada? You can make it happen. To narrow down your options, consider your ideal number of guests, the cost for them to attend and where they will be travelling from. Also, think about the time of year, time zone and currency exchange rates. You’ll want to find a wedding planner who’s well-versed in how to plan a destination wedding to run your show (even better if they’ve planned one in your destination before). This is a definite stress-reliever as they’ll know exactly what you’ll need to get in order abroad. As a bonus, many resorts offer destination wedding packages that include a planner to handle all the details or can refer you to a local planner. It would be amazing if we could put a hold on life and spend a few months perusing table linens and floral arrangements in a place like Ibiza, but who’s got the time - or money - for that? Use the internet to your advantage and connect with suppliers abroad through avenues like Pinterest. Find more tips here for how to plan a destination wedding from a distance. Once you’ve chosen your location, you’ll want to make sure you can get married there. If you’re saying ‘I do’ abroad, the Government of Canada recommends contacting the embassy or consulate of the place you’re planning on getting hitched so you aren’t met with any nasty surprises when you arrive. You’ll probably need a few extra documents and may need to get some translated, so look into it early. If you’re getting married in another province, we've got all the info you need for how to get married in Canada. You probably don’t want to be booking your wedding during “hurricane season”, so remember to check when the conditions of your destination are most ideal. If you’re going off professional resort photos, you may be disappointed when you arrive, so if possible, go on a pre-wedding retreat to see if the destination you fell in love with during the research phase is for you. There’s no doubt about it, destination weddings aren’t cheap. However, there are a few tips and tricks that’ll help you save cash. For example: use Hopper to check when flights to your destination are least expensive or ask a travel expert about inexpensive package deals. Hotels and resorts also tend to offer group pricing, so look into that. Speaking of money, your wedding budget will have to be a bit flexible. Now, don’t get too outrageous with your spending and definitely have a cap-off, but things may change and costs may fluctuate. For example, if your maid of honour can’t afford the journey, you may have to pick up her bill. Pro tip: read our article about who pays for what in a destination wedding. Yeah, it’s your wedding, but your friends are throwing down a pretty penny to watch you tie the knot, so treat them well. Use your wedding website to offer them recommendations for what they should pack (appropriate to the activities you have planned), share the expected weather conditions, arrange gathering spots and leave a welcome bag in their room for them to enjoy upon arrival. Basically, give them a good vacation. Though your heart might be set on that tulle-layered ball gown or a three-piece suit, it may not be ideal for your ceremony away from home. Consider everything from how your outfit will fare on the plane ride to how it’ll feel on your big day. A beach destination wedding dress is a whole different ball game, so remember to ask your stylist for some pointers if you plan on getting married by the water. While you may have spent hours upon hours searching for the perfect DIY wedding decorations, you don’t want to fill your luggage with a mess of craft supplies (sorry, Etsy and Pinterest fans, destination weddings may not be for you). If you choose your destination wisely, you won’t need to bring along too many embellishments. This is probably the hardest part, but there’s bound to be a few hiccups in your plans so try to remain calm. You won’t be able to manage every single detail, especially if plans are in motion before your plane touches down (which they will be). While the ceremony and reception should be your main concerns, you and your guests will most likely be staying at your destination for longer than just your nuptials. Plan a wedding welcome party, some group excursions and meals to keep things fun and interesting. This is probably a no-brainer, but you’ve already spent the cash to fly abroad, so why go elsewhere for your honeymoon? Once the reception wraps, scoot off to a secluded suite, second resort or an Airbnb to get some alone time with your new spouse. The chances are high that all your invitees will not make it to your faraway wedding. To avoid leaving out certain loved ones, host a party before or after you return.